A four double bedroom, three reception room detached family home which is situated in private road and forms part of an exclusive development of only four properties. Constructed approximately 13 years ago by Hillreed Homes this generously proportioned property is ideally located adjacent to Queen Victoria hospital and provides easy access to East Grinstead town centre and two train stations. 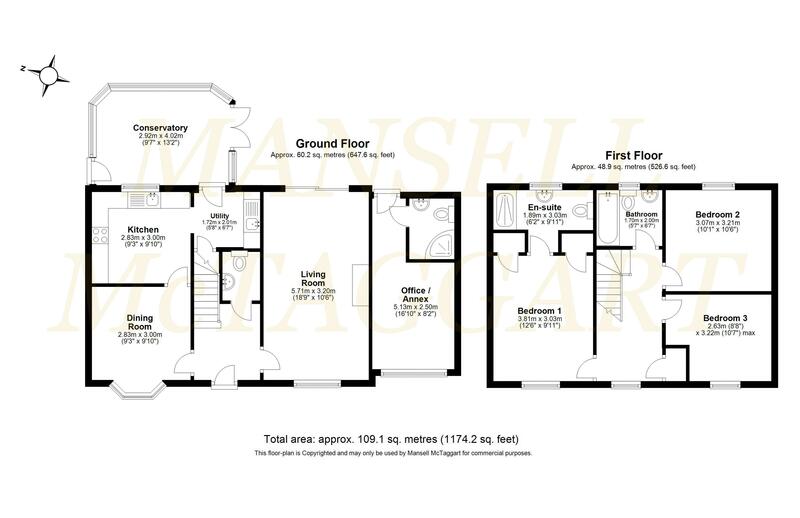 The versatile accommodation briefly comprises: entrance hall; cloakroom; double aspect living room; dining room; fitted kitchen; and a utility room with door to the conservatory. On the first floor there is a well proportioned master bedroom with fitted wardrobes and ensuite shower room; two further double bedrooms and a family bathroom. The garage has been converted to create a fourth double bedroom/study with ensuite shower room completes the living accommodation. Externally there is driveway parking for two vehicles and gated side access is provided to the rear garden which is mainly laid to lawn and incorporates a patio area. The popular market town of East Grinstead is located approximately half way between London and the South Coast, boasts a wealth of architectural heritage and is surrounded by some of the finest countryside in the South East, including the Ashdown Forest. There is a vast selection of shops, pubs, restaurants and coffee shops to cater for all. East Grinstead mainline train station provides frequent services to London (Victoria/ London Bridge in approx 1 hr). Ideally situated for access to the M23/M25 motorway and Gatwick Airport. From our office on London Road turn right before taking the first exit at the roundabout onto High Street. Continue straight and then take the first exit at the roundabout onto College Lane. Continue onto Blackwell Hollow and turn right at the roundabout onto Holtye Road. Proceed past the Hospital and Tudor Gardens can be found on the left hand side.